This month, we’ve had Bare Snacks Cinnamon Apple and Cinnamon Banana Chips in the office. Needless to say, we are excited to try even more varieties. If you’ve had another flavor, leave a comment with what we should try next! They Taste Good! We are all about eating foods that we enjoy, and these were a great snack to have on hand. The cinnamon flavor gives a classic twist to the sweet bananas and apples. 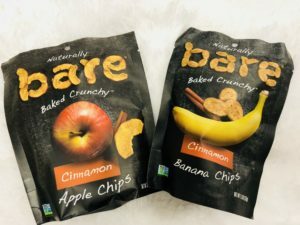 Easy Snack on the Go – When we’re in a time crunch, we like having quick and easy options stocked that can be packed and taken to-go, and taking along a bag of Bare Chips does just that. Easy and Unique way to Eat Fruits and Veggies – You may not be able to stuff a sweet potato in your backpack, but you can have Bare Snacks Sweet Potato Chips in your bag! We love that these provide a different and satisfying way to eat fruits and veggies. The Crunch Factor – There is something satisfying about crunchy foods, and we love that Bare Snacks provides the crunch that is advertised. Whether you have the midday munchies, feel like a night snack, or just want something to crunch on, these chips have it! Kid Friendly – Sometimes, introducing fruits and veggies to kids can be difficult. Giving them a variety of textures and flavors can make them more approachable. Bare Snacks have many options that may intrigue kids and open the gates to trying more. Simple Ingredients – What you see is what you get with this snack. We appreciate the simple nature of the product, and that when we choose fruit or veggie chips, we are eating the real thing, just CRUNCHIFIED! Lots of Options – We had the Cinnamon Apple and Cinnamon Banana Chips in our office, but there are so many more flavors. Bare Snacks has everything from Chocolate Coconut Chips to Barbeque Sweet Potato Chips. We can’t wait to try!